The image above shows Caterhams new front wing for Suzuka (Image: AMuS) is variation on some of the concepts the team have already worked on but contains several new elements too. The separation of the mainplane is handled differently whilst the upper flap now becomes two separate flaps, having previously only split the flap so far along its length before. 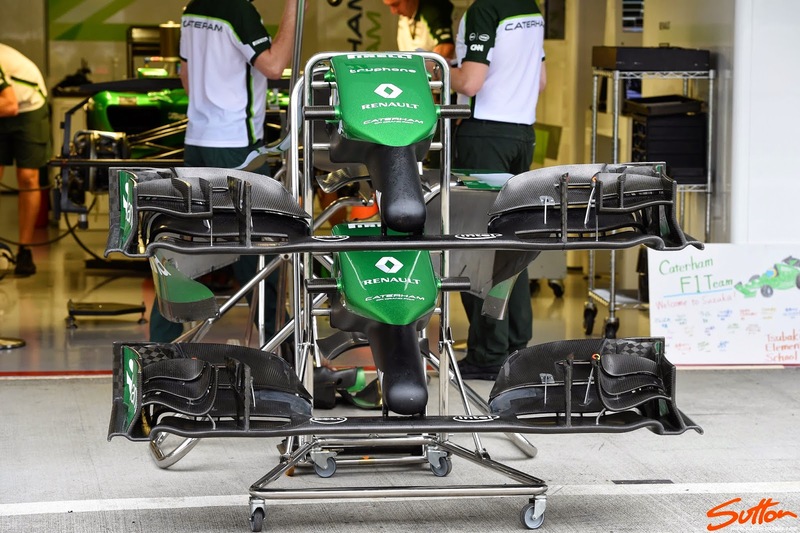 The reduction in width of the front wing from 1800mm to 1650mm for 2014 has meant that this years front wings are designed with more aggressive outwardly turned elements, Caterhams new iteration is no different. As I said the wing is not revolutionary but evolutionary, with the team actually returning to the cascade arrangement used earlier in the season, however you'll note an elongated horizontal blade now hangs off the endplate above the main cascade. The rearward blade is retained, albeit with a slightly revised design, whilst inboard of this the 'r' cascade has reverted to a singular element. 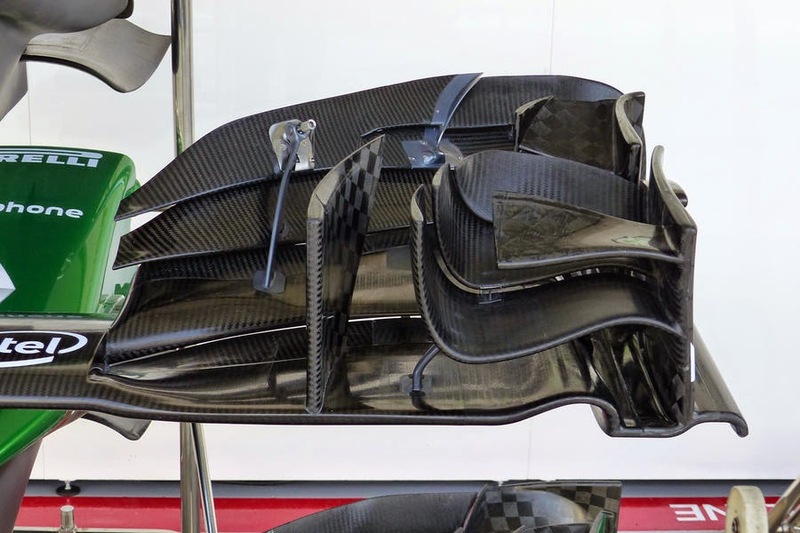 Interestingly the team have followed many of the other teams by adding a outboard endplate canard, mounting it to the rear endplate (2 piece endplate design). The canard creates a pressure gradient that entices airflow outbound, whilst shedding an elongated vortex that will marry with several of the airflow structures generated around it. Marcus liked the new wing! Did Kobayashi get the benefit of this at all?